Some of the Members of the Steering Committee, Landspitali University Hospital Family Implementation ProjectIceland is a small country with a population of just over 300,000 and my Icelandic friends are among the most patriotic people I have ever met. They share a strong belief about the collective responsibility of Icelandic citizens to help their country grow in excellence. It comes as no surprise then that Family Systems Nursing has taken hold in Iceland in a major way through strong and courageous partnerships between academia and practice. My colleague, Erla Svavarsdottir, RN, PhD, Professor of Nursing at the University of Iceland, who is the leader of Family Systems Nursing in Iceland, completed her doctoral education with Dr. Marilyn McCubbin at the University of Wisconsin, Madison where she received an excellent grounding in the importance of families in health and illness. She returned to Iceland and decided to grow capacity in family nursing through several initiatives, including inviting Dr. Lorraine Wright and me to offer two intensive master’s level courses in June 2003 and June 2004 about the Calgary Family Practice Models (including CFAM, CFIM, and the Illness Beliefs Model) (Wright & Bell, 2009; Wright & Leahey, 2013; Wright, Watson, & Bell, 1996). We provided practical tools and skills focused on strengthening the nurse’s ability to offer family nursing interventions through therapeutic conversations with families about the family’s experience of illness and illness suffering. 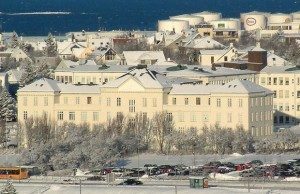 Many of the graduate nursing students who were enrolled in these courses assumed leadership positions in health care in Iceland and promoted the importance offering Family Systems Nursing through therapeutic conversations with families in practice settings. As Erla described in a paper she wrote (Svavarsdottir, 2008), she had a conversation in 2006 with the Chief Nurse Executive, Anna Stefánsdóttir, of Landspitali University Hospital–about the need to implement family nursing theory in practice settings. Thus began the ambitious and very courageous Landspitali University Hospital Family Nursing Implementation Project (2007-2011) of translating Family Systems Nursing knowledge into practice at an institutional level–on every unit of a large 900 bed university hospital! A Steering Committee of nurse leaders from practice and academic developed a plan of implementing and evaluating the family and nurse outcomes of offering practicing nurses an educational intervention that would enable them to practice family nursing and offer brief therapeutic conversations to families in every unit of the hospital. I had the pleasure of awarding Anna Stefánsdóttir, RN, MSc; Anna Ólafía Sigurðardóttir, RN, MS; Elísabet Konráðsdóttir, RN, MSc; and Eydís Kristín Sveinbjarnardóttir, RN, MSN, an Innovative Contribution to Family Nursing Award from the Journal of Family Nursing in 2009 for their courageous leadership in helping to implement this unprecedented knowledge translation project in an entire hospital (Bell, 2010). The results of this carefully designed knowledge translation project are now beginning to appear in the published literature with Dr. Erla Svavarsdottir and her doctoral students, Eydís Sveinbjarnardóttir and Anna Ólafía Sigurðardóttir serving as co-authors of several of the research publications. The publications to date focus on small sample, randomized controlled studies of families who received therapeutic conversations from nurses during the hospitalization or out-patient care of a family member. A variety of families and illness concerns are represented in this data set. The publications also include the psychometric development of two new research instruments (see Sveinbjarnardottir et al. 2012a, 2012b) that measure family functioning and family perception of support from nurses–instrument items derived from the Calgary Family Assessment and Intervention Models (Wright & Leahey, 2013). Sustaining the change in practice is currently ongoing. I am SO VERY PROUD of the advancement of family nursing that has been accomplished by my colleagues in Iceland and I hope that by reading these publications, others will catch a glimpse of what can be possible in family nursing knowledge translation when one has courageous vision, strong administrative support, and a team of clinically grounded nursing leaders who are educationally prepared and committed to grow capacity in family-focused care throughout a large healthcare system. This pioneering work is already providing the methods and tools for family nursing knowledge translation research in other places around the globe. Blondal, K., Zoega, S., Hafsteinsdottir, J. E., Olafsdottir, O. A., Thorvardardottir, A. B., Hafsteinsdottir, S. A., & Sveinsdottir, H. (2014). Attitudes of registered and licensed practical nurses about the importance of families in surgical hospital units: Findings from the Landspitali University Hospital Family Nursing Implementation Project. Journal of Family Nursing, 20(3). Halldorsdottir, B., & Svavarsdottir, E. K. (2012). Purposeful therapeutic conversations: Are they effective for families of individuals with COPD? A quasi-experimental study. Vaard I Norden [Nordic Journal of Nursing Research], 103(32), 48-51. Sveinbjarnardottir, E. K., Svavarsdottir, E. K., & Wright, L. M. (2013). What are the benefits of a short therapeutic conversation intervention with acute psychiatric patients and their families? A controlled before and after study. International Journal of Nursing Studies, 50(5), 593-602. Elísabet Konráðsdóttir, Iceland, teaching family nursing practice skills to nurses at Landspitali University Hospital, Reykjavik.